I came across this site, which is from the author of the winning IOCCC entry, 8086tiny! It’s ballooned from just under 4kb to 28kb, but still incredibly tiny! It’s worth checking out for some old time PC/XT nostalgia! Author neozeedPosted on March 22, 2014 October 6, 2016 Categories 8086, IBMPC3 Comments on 8086tiny de-obfuscated! 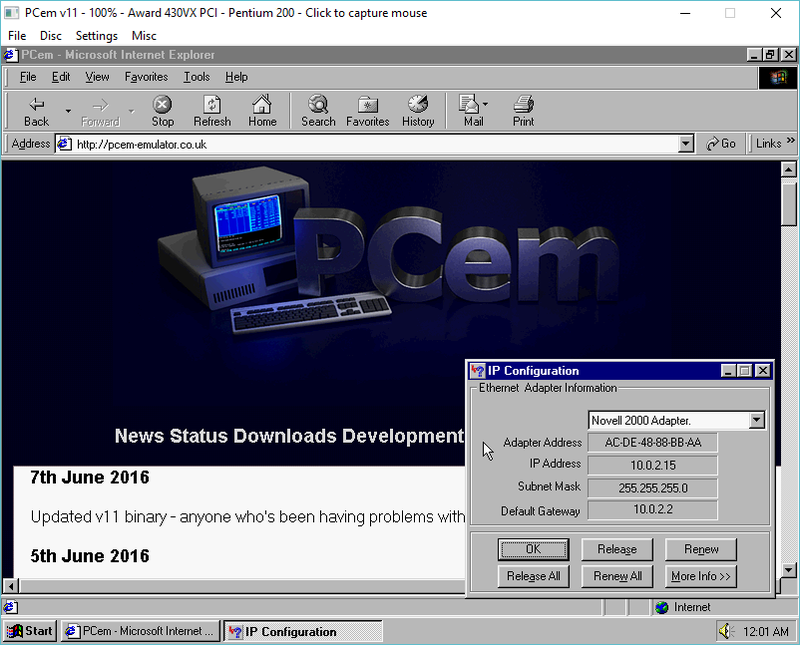 The main qemu page hasn’t been updated yet, but the download page has the source to the new version of Qemu. I’ve gone ahead and built binaries for OS X, both a full version, and a i386 minimal version. 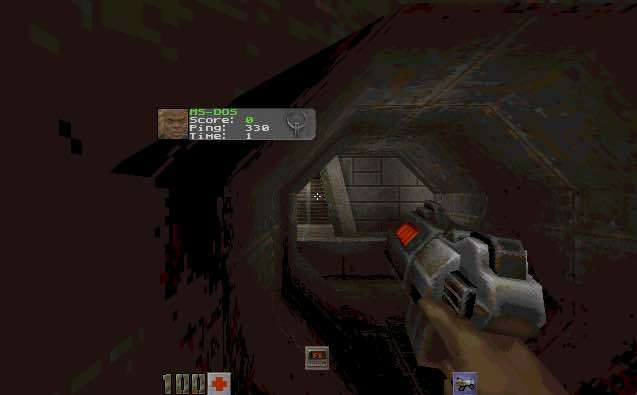 As always testing is very minimal, all I’ve done is installed MS-DOS 6.22 & Doom 1.1, and tested the SoundBlaster 16 emulation. And as with the pre-release versions, the adlib code is still broken. And Ive done the ‘better’ fix in this code regarding that. I haven’t run anything else, including fun things like the PowerPC & OS X emulation, MIPS with Windows NT, or even trying anything x64 based as I’m sure it is still broken from back in the Qemu 0.90 days. Author neozeedPosted on December 15, 2013 Categories i386, IBMPC, powerpc, qemu, x64, x86_642 Comments on Qemu 1.7.0 released! There is no denying it, when it comes to revolutionary products you simply cannot ignore the powerhouse that was, Windows 3.0 . Simply put this is what made the Microsoft empire, broke the alliance with IBM, and changed the future of OS/2 3.0. Not only that, but Windows 3.0 changed the way businesses operate world wide, and finally delivered on the ‘dream’ of what could be done with the 286/386 microprocessor where OS/2 had failed. To really appreciate Windows 3.0 you have to see the world as it was before it was under development. 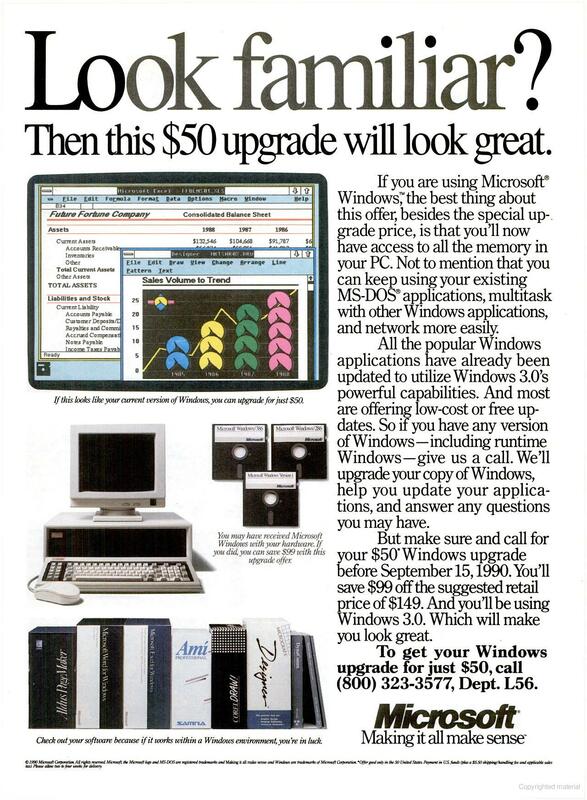 Back in 1989 the pc market was in turmoil. While OS/2 had the promise of breaking all the old barriers of the real-mode only OS MS-DOS, it simply cost too much, and hardware compatibility was just too poor. 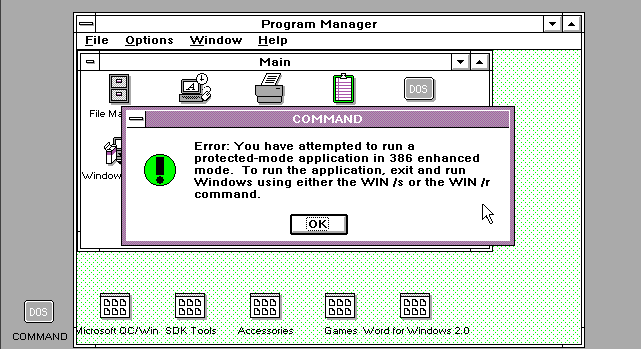 The other striking thing was that the only 386 specific feature that OS/2 1.2 (current version in 1989) could exploit was that the 386 could quickly move in & out of 286 protected mode. The LAN server product also had a 386 specific HPFS driver, but that was it. OS/2 1.2 was still limited to a SINGLE MS-DOS box. And there wasn’t a heck of a lot you could do memory wise. Not to mention there was no ability for the DOS session to use EMS/XMS memory. It’s no wonder it became to be known as the ‘penalty box’. Meanwhile, Windows/386 circa 1987 could run multiple MS-DOS VDM’s on the 386 processor. You were only limited by how much extended memory was in your system. Windows/386 exploited the v86 mode of the 386 processor which allowed for hardware virtualization. However Windows itself was a ‘real mode’ program, meaning that it had to fit in 640kb of ram, just as the VDM’s it spawned had to. So unless your goal was to run a bunch of MS-DOS sessions all your extra memory was for nothing. 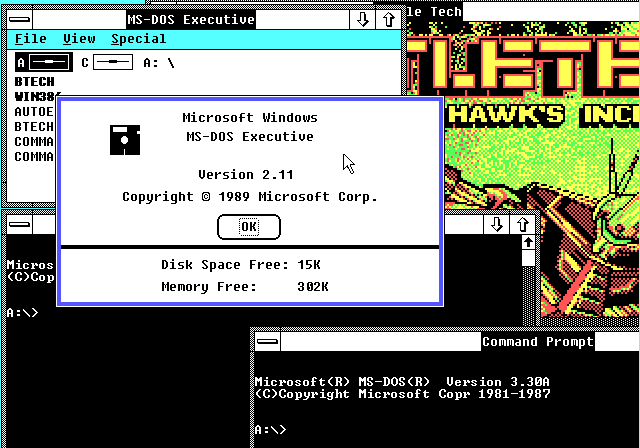 That also included Windows programs since they all ran in real mode. For people with enough disk space you *could* actually install one copy of Windows/386 in say VGA, then another with a lower video resolution (CGA or EGA), then actually run Windows in Windows… in a Window. But it really wasn’t that useful, it ran better full screen. And all this had the effect of doing was partitioning your windows programs from each other, if you dedicated a VM per application. 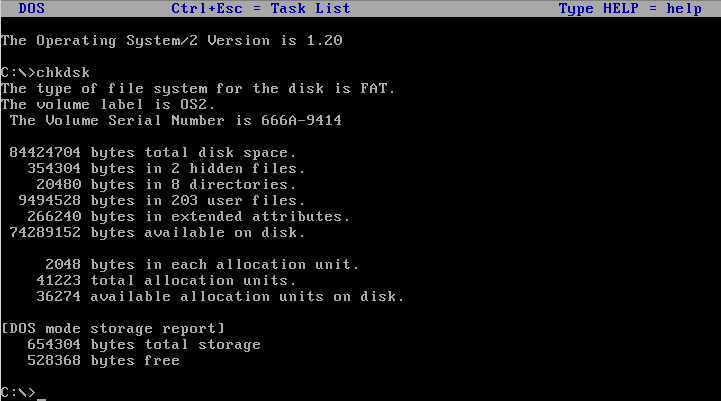 Needless to say with OS/2 2.0’s seamless windows this was far more easier to setup, and frankly far more practical. In 1989 building large applications meant that you either forced people to use Unix (SCO Xenix!) or OS/2. For those that could afford it, Xenix would have been the way to go, as they not only ran in 386 protected mode, offered a far larger address space, but it was also multiuser! But Xenix was expensive, needed specialized knowledge. And as mentioned the cost of OS/2 development was HIGH, and it required your end users to have OS/2 (naturally). And the users would have to fight that a lot of PC/AT compatible PC’s on the market were not compatible enough to run OS/2. 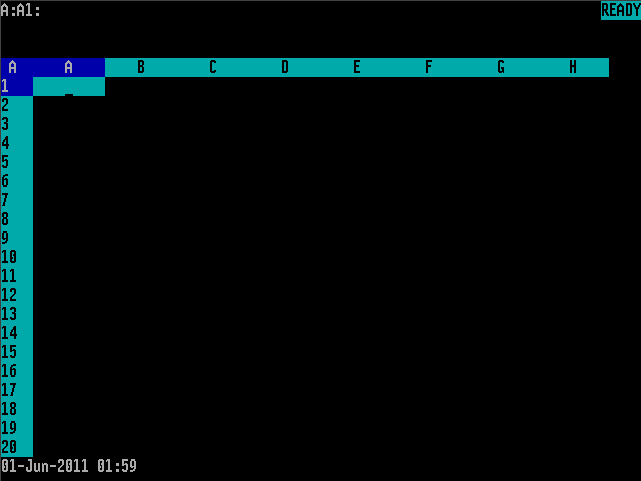 Despite this a lot of banks latched onto OS/2, and some still use it today (look at why parallax came into existence!). Then out of nowhere, PharLap had developed a piece of software that changed everything, the DOS Extender. 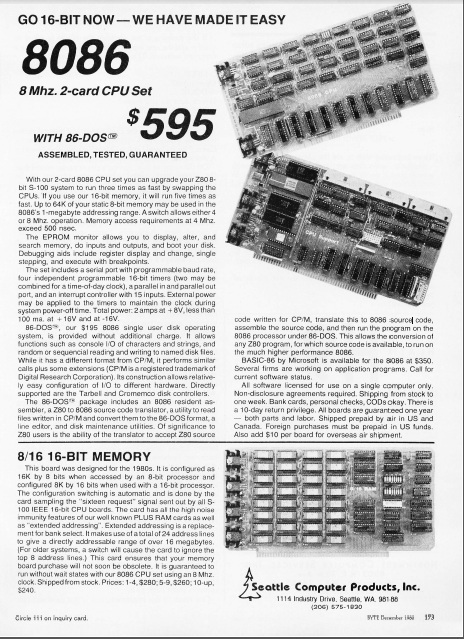 Originally for 386 computers, the first DOS extenders required people to use special 386 compilers, runtimes, and of course linkers & extenders. The tools were expensive, the right to redistribute wasn’t free, but end users could run your multi-megabyte (lol) applications on regular MS-DOS. Which is what 99% of PC’s were running, and it didn’t require users to change their OS, abandon their applications, it would simply just work. 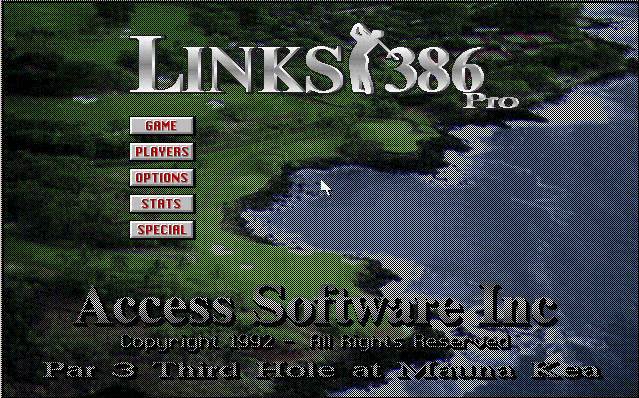 One of the earliest and most popular DOS Extended game/application was Access Software’s Links 386 pro. That’s right this game ran in protected mode! .. And it would *NOT* run under, or near Windows/386. It was out of this wildly great but incompatible world that the first DOS Extender vendors, tried to standardize their products with the original and short lived VCPI specification, from Phar Lap. 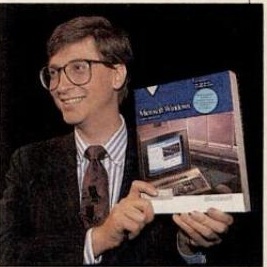 However in 1989 Microsoft was busy working on Windows 3.0 as the next great thing. Using a protected mode debugger, they were converting Windows/386 from a real mode ‘hypervisor’ into a protected mode application. And if Windows couldn’t run these new extended applications, then people would naturally have to exit Windows to run them. And that was the major problem with Windows is that people may have an application for windows but they spent most of their time in DOS. So Microsoft’s Ralph Lipe came up with the DPMI specification, managed to get all of the major vendors to support and take over it, in exchange for leaving Windows as a 0.9 level client/server. After all why would you need their products if Windows were to incorporate the entire 1.0 spec? At the time it was a big deal, but the success of Windows would eventually kill the extender market save for video games until Windows 95. There is a great article about the rise of DPMI here. No Lotus 1-2-3 r3 for you! Another popular application for MS-DOS just happened to be Lotus 1-2-3, and it was *NOT* DPMI compliant. Oh sure they had DOS & OS/2 support, but would you believe that the OS/2 version wouldn’t run in a Window? Oh sure the install program may have, but some how someone didn’t think there would be any value in being able to SEE more then one application at a time. Not to mention the dark horse, Excel was starting to sell in 1987 like crazy, in 1988 Excel actually started to out sell 1-2-3, and by 1989 it was already over. There is no doubt about it, GUI applications were taking over. The old ‘DOS’ interface was dead. And Lotus had basically killed their product line by providing an identical interface and experience to their customers by providing an OS/2 application that looked and felt just like the MS-DOS application. 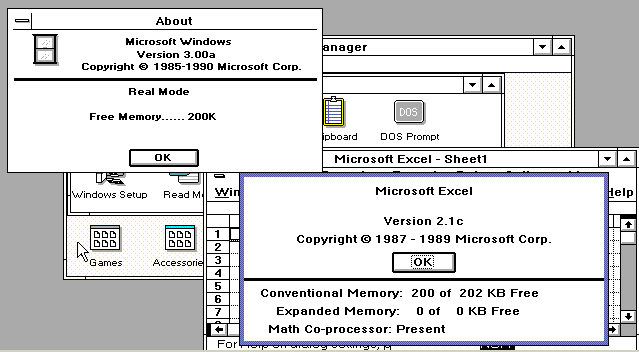 While you may hear that Lotus got distracted with OS/2 and missed releasing a Windows version of 1-2-3 to counter the rise of Excel, the truth is that they straight up missed windowing UI’s. Their hubris is that the users simply didn’t like the 1-2-3 interface, they wanted a windowed application. What they did want was graphical Windows, and of course more memory! And there is nothing more annoying than having say 16MB of VERY expensive memory in a computer like a 286, but being restricted to 640kb or less is just … insane. So let’s see Excel in action. 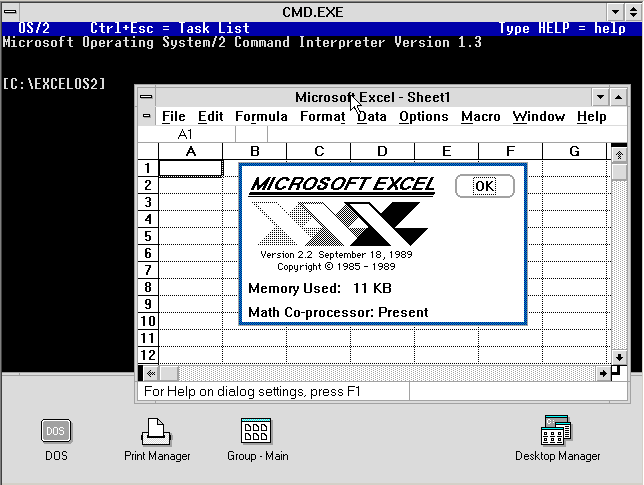 Excel 2.1c shipped with a ‘runtime’ version of Windows 2.1. Mostly because nobody was buying Windows in 1987 Microsoft had to do something to get people running the thing. So the best way was to allow you to run an application with it. By late 1989 and early 1990 application vendors were making updates to their products so that they could run under Windows 3.0. And here is the first version of Excel to do so. 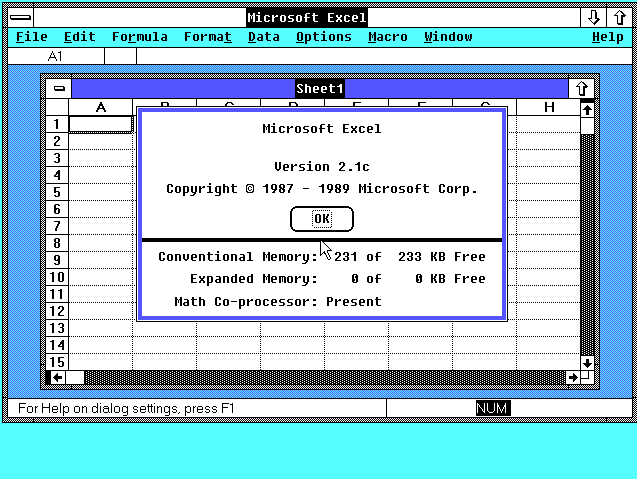 So here we have Excel running under Windows 2.1 ala the runtime environment. All you have here is excel. 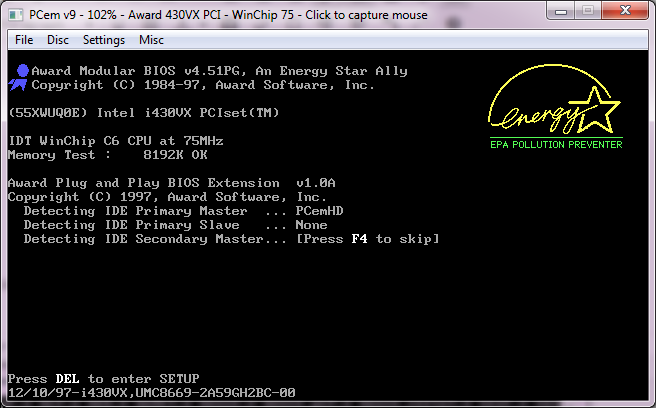 Also worth noting is that the setup program is 100% DOS text based. Moving forward we can now upgrade to Windows 3.0. 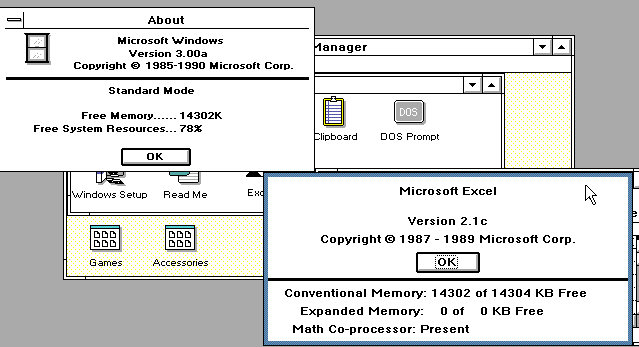 So as you can see Windows 3.0 takes up 30kb more memory then Windows 2.1! For someone with an XT this could mean bad news! Now it’s time to see what all the babling was about, running the same application in protected mode to access more memory! Now we are running in 286 ‘standard’ mode. Notice that Excel thinks it’s conventional memory, but we now have 14MB of the computers installed 16MB accessible to the application! Now this is pretty amazing stuff! Now it’s no secret that the 286’s memory management left a lot to be desired, and Microsoft really didn’t want to write for it, as the 386 was where they wanted to be. So unlike OS/2 the 286 cannot swap. You are only limited to what extended memory you have in your computer. 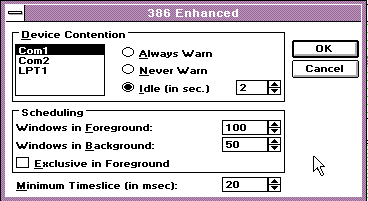 But this is different for the 386..
And here we are, 386 enhanced mode! So finally our Windows applications are clearly running in protected mode, with demand paging! With 36MB of available memory in a computer with 16MB of ram. The colors are distorted on Virtual PC under 386 enhanced mode… But as you can see the environment runs! 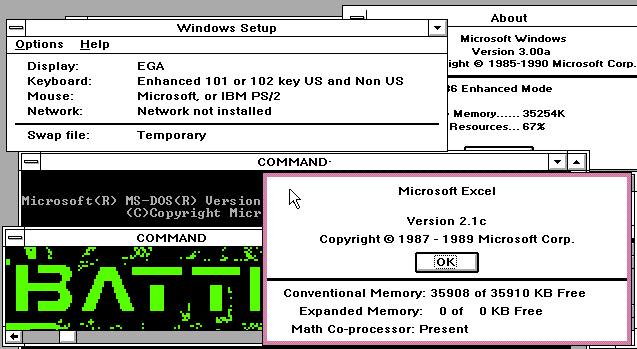 And even graphical programs that for example used CGA could happily run on an EGA system in a window. Even better you could copy the screen, and paste it into any Windows application you want. Yes you could buy games and use them for clipart! As always, there is a great InfoWorld article here. So why was Windows 3.0 successful? A lot of it is timing, as there was no other environment that could offer people access to their whole machine without upgrading their operating system. And of course there was the whole thing with bundling Windows, Word & Excel with new computers. I mean who would resist something like a graphical application like Excel when compared to the klunky and significantly more expensive 1-2-3? Sure the bundling practices were found to be illegal, but looking back, Lotus & Word perfect basically GAVE Microsoft the market. And of course, talk about aggressive upgrades! I’m not sure they even do such things anymore. Although I’ve heard of big companies, and governments pushing for discounts for running things like Linux. And there is the other things that Windows 3.0 supported that OS/2 simply did not. For starters backgrounds (wallpapers), and of course the desk accessories. Sure they sucked but in a panic at lest you *could* do something… where OS/2 basically left you in the lurch. 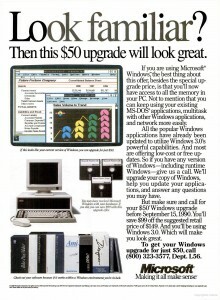 Not to mention how much more expensive OS/2 was when compared to Windows. So with all that out of the way, what fun is a write up without a demo? And thankfully I’ve found all the bits in prior posts, and I can put them together right here. 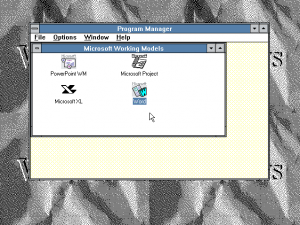 Windows 3.0 working demo, click to launch!